Nature’s Sunshine’s PEA PROTEIN PLUS, a fantastic vegetable protein, whole food drink mix, that contains a vast array of healthful, nutrient-rich natural ingredients in one great tasting shake. Each serving of Pea Protein Plus, provides 13g of vegetable protein in a comprehensive nutritional blend that provides generous amounts of the daily recommendation for a wide range of vitamins and minerals, in a unique formula of nutrient-rich greens, fruits and herbs. Along with generous levels of vitamins and minerals, Pea Protein Plus formula includes plant-derived enzymes, fibre, essential fatty acids from flax seed and borage oil, and a herbal blend that includes ‘ceremonial grade’ matcha which is grown and harvested in Japan under the strictest traditional methods. Having plenty of energy helps us to make the most of life, and the comprehensive range of B vitamins in Pea Protein Plus are known to offer a range of health benefits, contributing to normal energy yielding metabolism for energy, endurance and stamina, a reduction in tiredness and fatigue, and a healthy nervous system. B vitamins cannot be stored in the body so need to be replenished every day. Green vegetables are an important source of daily nutrition and are bursting with antioxidants, fibre, vitamins, and minerals such as calcium, magnesium, iron and potassium. However, many of us simply don’t include greens in our daily diet, and when we do, much of the valuable nutrition is often lost during cooking. Pea Protein Plus includes a superb, varied blend of whole foods and greens in its great tasting formula, making it easy to obtain valuable nutrition every day. 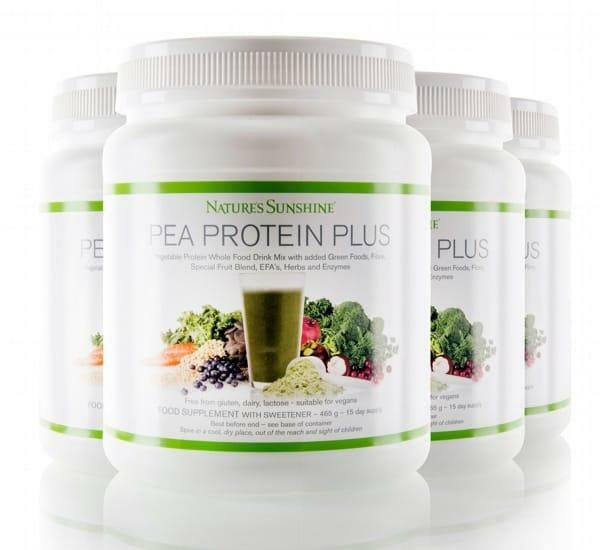 Nature’s Sunshine’s Pea Protein Plus is ideal for anyone wishing to increase their daily protein intake with an easily digestible, high quality vegetable protein. Use daily as a nutritious, filling snack, a boost at breakfast, a post workout shake, a mid morning top-up, or a satisfying meal replacement for those on the go. Pea Protein Plus is great anytime of day, and however you take your shake, it will be bursting with natural goodness!